It is time to reignite Cass and we are starting with the heart of the County, your County seat, the Village of Cassopolis! We have been fortunate enough to work the past six months with Michigan State University and the Sustainable Built Environment Initiative on a visioning, design and planning process that has brought the Village, the County, the Economic Development Committee and the entire community together like never before! Throughout this process we have continued to build bridges of communication between residents, local governments, and businesses to share common goals, and have our voices heard; and what we learned is that this community is engaged and eager to move forward! What you may not have realized, is that simultaneously, the Village has been working cohesively with MSU and Wightman (a planning, engineering and architecture firm) on its master plan in order to have a completed and comprehensive plan driven by the citizens. While the MSU visioning initiative focused on the Broadway Corridor, the Village has been taking a look at its Neighborhoods, Parks, Stone Lake, Industrial Park and the downtown areas, as well as, working with Cassopolis Public Schools on opening a coffee shop in the Village! In these past months, we have felt a tremendous surge of community energy and witnessed the new enthusiasm. Can you feel the excitement? Now is the time to implement our next steps for developing a downtown Cassopolis that captures the vibrant look and exciting, fun and energetic feel that we have all envisioned! We can make it happen – with your help! What are our next steps? We are going to move forward with our plan – one piece at a time – and bring our Vision into focus. The Village is continuing master planning panel discussions with Wightman regarding all of these key design and location concept areas beginning next month, and we want you to join those discussions. These meetings will lead not only to the overall final Comprehensive Master Plan and design for the Village, but will provide the strategy behind implementing that plan; including how we line up the specific tasks, priorities, processes, funding and communities’ goals to execute the change we are looking to get done. Make sure you are receiving all our meeting dates and continued information by using our online registration system at http://signup.com/go/eLZyWFv. Take a look at the Village of Cassopolis Broadway Corridor Vision as presented by MSU School of Planning, Design and Construction: Broadway Corridor Vision. Keep the Forward Momentum Going, Stay Positive, Stay Involved, Stay Informed and Stay Tuned for the next meeting dates! A very “Special Thanks!” to our Sponsors! Follow our progress in the News! Be sure to Follow Imagine Cass on Facebook! Why is Cassopolis ready to move forward? Check out Cass County Administrator Karen Folks discussing why this community is so ready to move forward and continue the work we started with Imagine Cass – Embrace the Vision! What has been the participation level from the Community throughout the Imagine Cass – Embrace the Vision! Movement? Listen as Wayne Beyea from Michigan State University discusses that the participation and enthusiasm from Cassopolis is the best he has seen in over 100 communities and 15 years of doing this! How important are the planning efforts to make the Imagine Cass – Embrace the Vision! Project a success? Troland Clay, chairman of the Cass County Economic Development Committee discusses igniting the love for the County, and how we put together a strategy to line up process, people and funding to get things done. Why did you decide to build your business in Cassopolis? Local business owner, Ted Gogol, Co-Owner of the Lodges at Stone Lakes, discusses why now is the right time for Cassopolis to move forward! 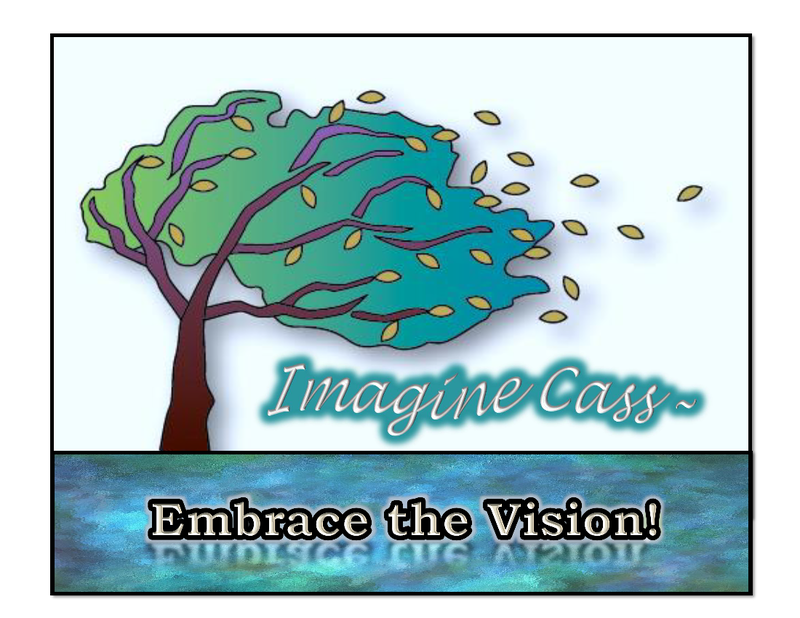 What makes Imagine Cass – Embrace the Vision! different from other campaigns? Listen as Architect and Planner Jorden Parker of Wightman talks about the cooperation between the local partners and residents to make this a cohesive and true plan of the citizens and residents.